Arteries are blood vessels that typically distribute oxygenated blood (red) into the body. They are muscular vessels and contribute to a person's blood pressure. Veins are vessels that typically bring deoxygenated blood ( blue) back to the heart. These vessels are not very muscular but rather can accommodate large amounts of blood to help return blood to the heart. ​In the heart-lung circulation, the pulmonary artery brings deoxygenated blood from the right side of the heart to the lungs to be oxygenated. This oxygenated blood is then drained back to the heart by the pulmonary veins. What are the layers of a blood vessel? There are 3 layers to a normal blood vessel 1) the intimal layer, 2) the media layer and 3) the adventitial layer (see figure 3). The innermost layer is called the intimal layer. This layer is the surface that blood flows against and is made up of cells called endothelial cells. ​The middle layer is called the media. This layer is made up smooth muscle cells that provide structure and contractile function to vessels. In veins, this layer is very thin compared to arteries. The last outer layer is the adventitia. This is comprised of many cell types. The most common cell type is the fibroblast. This cell type can produce proteins that help give the vessel structural support. Why are pulmonary veins important? The pulmonary veins drain blood from the lungs back into the left atrium of the heart (Figure 1). The pulmonary arteries connect the heart to the lungs and allow the blood to get oxygenated, while the pulmonary veins are essential for bringing oxygenated blood from the lungs back to the heart. Typically, there are 3 right-side pulmonary veins and 2 left-sided pulmonary veins. Sometimes, a child can be born with pulmonary veins that do not connect to the heart in the normal way. This is called anomolous pulmonary vein connections- or simply put, abnomally connected pulmonary veins. 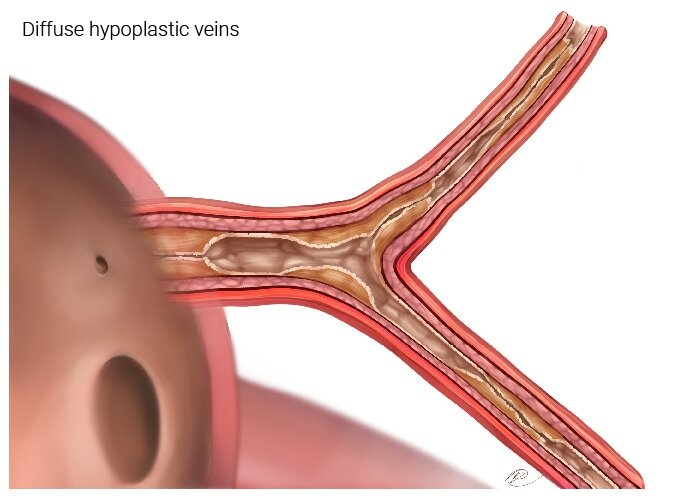 These veins can drain to different structures in the chest, and typically, children have surgery to connect the pulmonary veins back to the left atrium. Figure 1. The pulmonary veins ( right and left) drain oxygenated blood from the lungs back into the left atrium. Blood in the left atrium will then go into the left ventricle and be pumped to the rest of the body. The left atrium sits on the left side of the heart and is located at the back or posterior aspect of the heart. What is Pulmonary Vein Stenosis? Pulmonary vein stenosis denotes a narrowing or blockage in the pulmonary veins. The narrowing is not the same in all children. 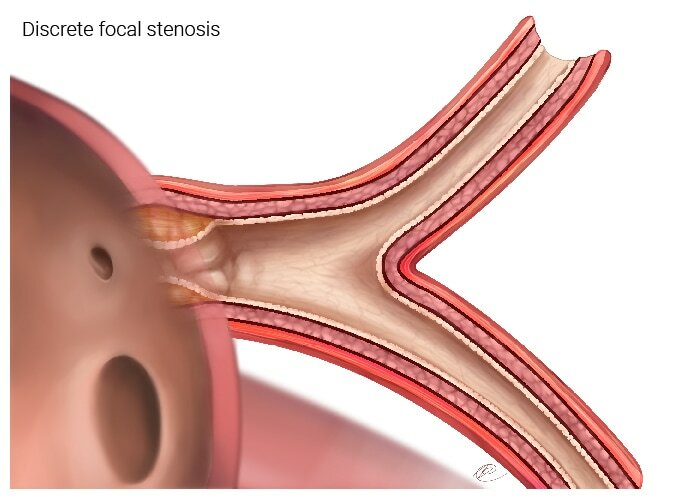 Some children have a very focal and discrete stenosis ( Figure 2a) that is close to where the veins join the atrium. Some children have stenosis that involves long segements of the vein ( Figure 2b). In some children, the vein can be completely blocked with no flow (called occluded or atretic veins) (Figure 2c). It is thought that this is likely the result of progressive disease and then causes the affected vein to no longer drain blood. ​Each child is unique! Children can have pulmonary vein stenosis in one pulmonary vein or multiple pulmonary veins can be affected. ​If one or more pulmonary veins become narrowed, it becomes harder to have blood move through the lung. When this happens, the pulmonary artery pressure increases ( pulmonary hypertension) and makes the right heart work harder to push the blood through the lungs. Eventually, if the pressure remains high, the right heart gets tired and may not work properly ( right heart failure). Figure 2a. This shows a pulmonary vein that has a discrete focal stenosis right at the junction of the pulmonary vein and the left atrium. The rest of the vein can have minimal or no disease. This type of disease can be addressed by surgical or catheter based interventions. ​Figure 2b. This depicts a pulmonary vein that has more extensive disease. The areas of stenosis have extended up into the veins that are in the lung tissue (parenchyma), in addition to being close to the left atrium. This type of disease will be harder to treat and if spreads to more than one vein, can result affect lung function. ​Surgery can only address the disease that is close to the left atrium. Blood can still flow in this vein, but the flow will be reduced. ​Figure 2c. This depicts a pulmonary vein that is severely affected by disease. Blood has very hard time draining back into the left atrium and it is hard for the right heart to pump blood into this part of the lung. ​How do the veins become narrowed? ​The narrowing occurs in the inner layers of the vein wall and is due to an accumulation of cells. These cells are likely myofibroblasts- a specialized type of cell that accumulate in response to different situations and can lead to fibrosis or scar in the vessel wall. We do not know what triggers these cells to accumulate or where they come from, but research is being done to try to understand this process (Figure 3). Figure 3. Pathophysiology of pulmonary vein stenosis. ​The exact sequence of events leading to PVS is not known. Evidence from human histology and pathology , as well as research models, demonstrates that in PVS, there is formation of a neointimal lesion between the intimal and media layers. This neointima is comprised of cells called myofibroblasts and secreted proteins called extracellular matrix. 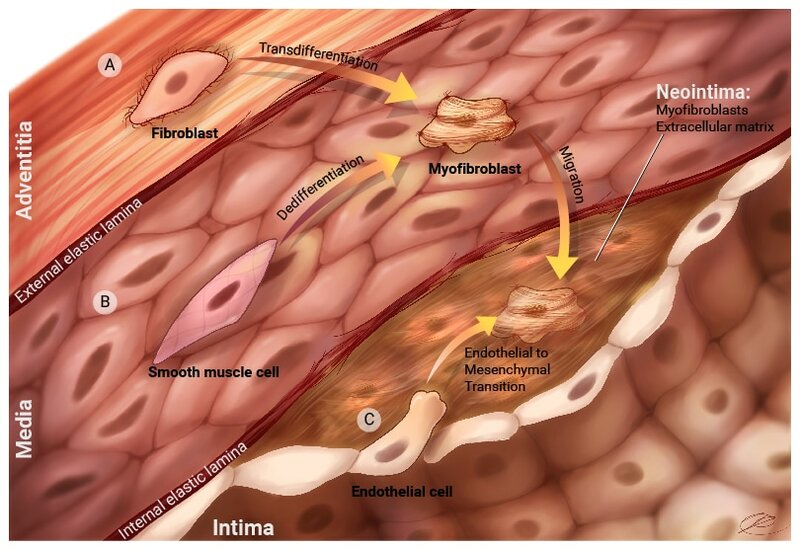 Myofibroblasts are specialized cells that secrete extracellular matix and other proteins and are important in biological processes such as fibrosis and wound healing. The myofibroblasts may originate from a variety of sources. ​What is the difference between primary, congenital and post-repair pulmonary vein stenosis? Pulmonary vein stenosis can be categorized into different clinical types. The first type is called primary or congenital pulmonary vein stenosis. This is typically when pulmonary veins connect properly to the left atrium and the stenosis happens without any prior surgery or interventions on the pulmonary veins. This clinical grouping can also capture children who have pulmonary vein stenosis who are very premature. ​Who gets pulmonary vein stenosis? Any child can have pulmonary vein stenosis. We do not fully understand who gets pulmonary vein stenosis and why. This is an area of research that the PVS Network is trying to address. By collecting data on children with pulmonary vein stenosis, we hope to understand who gets it and who might be at risk of developing pulmonary vein stenosis. ​While pulmonary arterial hypertension is known to have a familial or genetic component, it is unclear if there is a role for genetics in pulmonary vein stenosis. We are currently undertaking a genetic study to try to answer this important question. ​From previous studies published in the literature, children who are very premature may be at increased risk of developing pulmonary vein stenosis. The role of infections and other environmental factors are unknown. Who is at risk of developing progressive pulmonary vein stenosis? We do not know why some children develop rapidly progressive disease, while others have a more stable or non-progressive type of disease. This is an area of active research as it will help understand who might benefit from early treatment. ​From previous studies published in the literature, we know that children with multiple veins affected by PVS and those with complex congenital heart disease are at increased risk of dying from their disease. How is pulmonary vein stenosis different from pulmonary venous obstruction and pulmonary veno-occlusive disease? Pulmonary venous obstruction can be used to describe a situation where the pulmonary veins have completely occluded or become obstructed. This can happen in children with anomolous pulmonary venous connections ( ie. the veins do not connect to the left atrium). It can also happen when pulmonary vein stenosis progresses. ​Pulmonary veno-occlusive disease is a disease involving the very small veins in the edges of the lung. Pulmonary vein stenosis is typically in the bigger veins in the lung. Both types of diseases result in an increase in pressure on the right side of the heart.